We are fortunate to have a beautiful garden which surrounds the house at Kagyu Ling. It is a large garden with several distinct areas – a dramatic sunken garden which is lawned and large enough for children to play; a terrace which is a lovely place to sit in the sun and great for communal meals; semi-formal beds at the front; and a peaceful woodland area for walking and sitting. The garden is looked after by a small group of sangha members who work one day a week, alongside regular volunteers: read about gardening at Kagyu Ling. 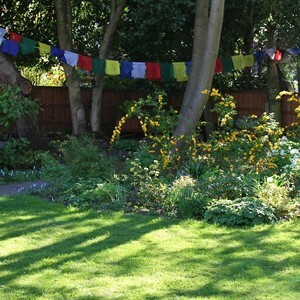 Each year, Kagyu Ling has a Garden Party, with live music, plants, home-baking, and children’s activities. It’s an entertaining, lively get-together for friends, families and neighbours and a chance for everyone to enjoy the garden. A surprisingly wide variety of plants survive the mostly very dry conditions. There is a range of trees, shrubs and herbacious perennials and a planter herb garden. Wildlife make their homes here too: the squirrels compete with the birds for the feeder, and the local cats make friends with the gardeners, and occasionally – when it is quiet – a hedgehog will creep along the grass. If you are interested in helping out with the Centre’s garden please get in touch – we’re always very keen to hear from people with gardening skills. Visit the volunteering page. If you’d like to help out financially, we’d also be grateful for donations. To make a regular donation to Kagyu Ling by standing order please speak to one of the centre co-ordinators. To make a one-off donation to support the work of the Centre, visit the donation page.